Finding suitable enterprise event management software can be a daunting task. There are a number of different factors you need to consider. For example, you have to look for a solution that offers stability, has experienced developers, uses best coding practices, and has a knowledgeable support staff. In addition to this, you have to consider if your internal staff has the expertise to implement the new software and the costs associated with deploying it. With this in mind, in this article, we’ll take a closer look at what features you should look for in an enterprise WordPress events plugin solution for businesses. Let’s say you need a software solution to plan and organize events that your enterprise hosts. You need to collect registrations forms, design and sell tickets, collect payments, manage attendees, gather feedback from participants, and download attendee data for reporting. A good event management plugin will help you automate and organize all of these tasks. Event Espresso is an enterprise WordPress events plugin that makes it easy for you to organize all sorts of successful corporate events like conferences, seminars, workshops, and training classes. As of this writing, the WordPress events plugin for enterprise powers over 40,000 event websites for all kinds of organizations – including colleges and universities, corporate organizations such as financial, medical, or healthcare businesses who offer training, and more. With Event Espresso, you can take control of every stage of your event, such as publishing your event details online, and accepting online registrations with custom form fields, and managing attendee data to event marketing. Once you have your registration forms and payment gateways set up, Event Espresso will take care of everything else on autopilot. For instance, the system will compile attendee registration data collected through registration forms into an attendee database. With this information, you can monitor event registrants, find out who checked-in and out of an event, which payment method they used, and much more. The plugin’s reporting and analytics tools allow you to calculate your ROI on events and track other important marketing metrics. This way, you’re able to determine how successful your marketing efforts were and what you can do to improve them in the future. Event Espresso comes with six different payment gateways out of the box with the ability to support an additional 17 payment gateways (available as premium add-ons). Offering multiple payment gateways to attendees gives them more flexible options to pay which helps you deliver a seamless event registration experience and sell more tickets. If your events are free, in the case of corporate training classes for example, you also have the flexibility to offer free tickets for your events. With Event Espresso, you can create as many different types of tickets as you’d like. Enterprise event organizers need software that offers stability, extensibility, security, and support. Here are some of the most important factors you need to consider when looking for an enterprise WordPress events plugin for your business. As an enterprise event organizer, you need stable software that works seamlessly with your existing tools and systems. You shouldn’t have to worry about fixing bugs or other compatibility or integration issues with your event management software. Generally speaking, enterprise event organizers use a variety of third-party tools for marketing, workflow management, reporting and analytics, communication, and task scheduling. So, the event management plugin they use must integrate with the tools they are already using. What’s more is that the ability to modify source code makes open source event management software suitable for rapid prototyping. This allows organizations to build upon existing functionality instead of reinventing the wheel in order to introduce new functionality. As of this writing, Event Espresso has been around for ten years and powers over 40,000 event websites. The software is entirely open source which means you can extend its functionality whenever and however you’d like. We recommend using hooks, actions, and filters to make safe and reliable modifications. This allows you to inject custom functionality into the software without risking losing the features when you upgrade your WordPress website. Software development requires both coding and business competency. Even the best developers can fail to create usable software if they don’t have a clear understanding of the industry and the end user’s requirements. Enterprise event organizers need software that translates their business needs into features and functionality that complements various event-related tasks. As an enterprise event organizer, you want to go for a WordPress enterprise events plugin that is developed by a team that has years of experience developing software for the events industry. Event management software vendors will gladly refer you to satisfied clients to confirm their solution’s competency in the event management industry. This track record helps you ensure that the software you’re about to integrate into your enterprise’s system is already industry-tested. Event Espresso is backed by a team of talented developers that have industry experience creating event software and catering to all sorts of events. Simply put, we know our stuff! Enterprise event organizers looking for software need solutions that fit their specific business needs. There are many benefits of using software that has been developed following best coding practices. What this means is that the code has been organized into smaller, reusable software systems that you can extend upon. Following best coding practices also ensures that the software is optimized for performance which means that it’ll run smoothly, won’t give errors, and will be compatible with different types of user data. Event Espresso is robust, customizable software that makes it an ideal candidate for event organizers looking for an enterprise-level WordPress events plugin. The software is based on object-oriented programming (OOP) which facilitates complex systems and is easy to build upon. Require assistance configuring the new software. Need help integrating with one of the tools the enterprise uses. This is where having knowledgeable support staff will certainly come in handy. Event Espresso’s team of developers and support staff are just a support ticket away for whenever you need help using the software. In addition to this, you will also have access to a knowledge base, documentation, community chat, support forums, and priority support. As an enterprise organization, you probably need to collect information about your event attendees at the time of registration or to sell event tickets. This may include personal information like attendee names, addresses, emails, and online payments. Since all of this information is stored and processed in your event management software, you need to make sure the plugin you use offers data security and gives you control over the data you collect. We recommend using event registration software that is GDPR compliant so that you retain control over how your data is collected, processed, and stored in the system. Event Espresso gives you the features and control you need to easily comply with the European Union’s GDPR. In most cases, open source software can be obtained at a very low cost (or no cost at all) and there isn’t a per-seat licensing cost. This provides a huge cost advantage to enterprise users who might need several copies of the software for their event organization department. This also allows enterprise users to share the responsibility of software maintenance and effectively reduce the total cost of ownership. 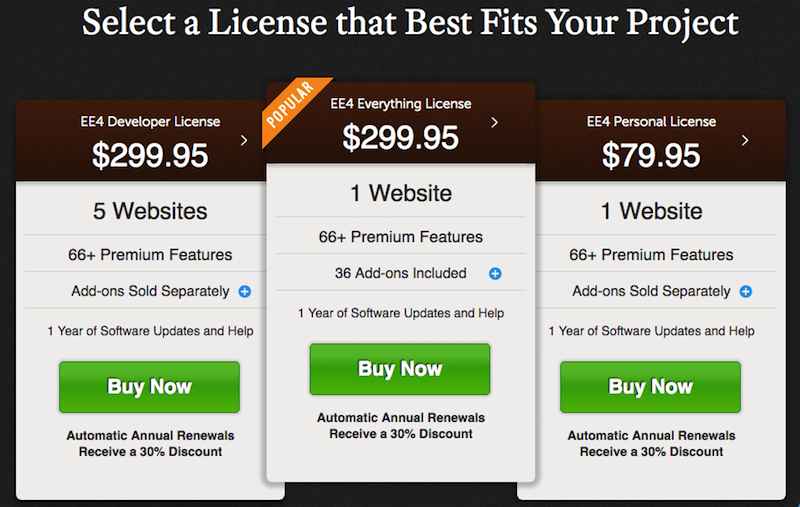 The Everything License– with 36 add-ons included in addition to software updates and technical support– offers the most value for enterprise users. Knowing what features to look for in a WordPress events plugin for the enterprise will help you pick the right tool for your enterprise organization and use it to plan and organize successful events. Stability and Extensibility. Enterprise event managers need software that is stable and can be integrated with other systems their organization already uses. Experienced Developers. Software developed by teams that have industry knowledge and experience will be better than software manufactured by someone with little to no experience. Best Coding Practices. Following best coding practices results in software that is optimized for performance and easy to build upon. Knowledgeable Support Staff. Having access to knowledgeable staff gives you access to competent people who can help ease the onboarding process. Security. Opting for an enterprise WordPress events plugin that’s GDPR compliant will help you keep attended data secure. Cost. There isn’t a per-seat licensing cost associated with open source software which means enterprise users can reduce the total cost of ownership. What are some features you look for in an enterprise WordPress events plugin? Let us know by commenting below.